Tuckasegee is derived from a Cherokee word meaning place of the turtle — homage to its meandering but perpetual pace — and Cherokee towns once thrived along it. Now, like then, people are drawn to the Tuck’s waters. The gentle rapids and swimming holes of the Tuckasegee tug and beckon during these sultry dog days of August. Luckily, the Tuck has never met a stranger. Whether you’re a mild wader, an adventure-seeker or family with children, all will find their own river niche on the Tuck. Float the wide, calm stretches or paddle through whitewater gorges. Pile the whole crew into a raft or launch a flotilla of kayaks. Take the Tuck plunge at a riverside park, comb the smooth river pebbles along the shallow shore, or hike to your own secluded sun bathing rock. From its pristine headwaters high on the summits, the Tuck plunges down the mountainsides and drifts across the valley floor, rippling through the idyllic Appalachian landscape of Jackson County for 40 miles. The river’s long journey serves up a plethora of public access points for jumping off —and jumping in. Not a river to be viewed from afar, the Tuck’s welcome mat is always out. Jackson County boasts 13 designated put-ins and access areas in all, running the full gamut of river features and recreation types. Remember to always wear a lifejacket in moving water, which can be deceptive. Also know what river hazards to avoid, like the Cullowhee Dam or the Dillsboro Drop. Below, we’ve shared a few of our favorite spots along the Tuck, but there’s far more to explore. Check out this map of public river access points along with this list of amenities at each site. The Tuck laps past the doorstep of Dillsboro, Sylva and Cullowhee, with ample options for capping off a day on the water. Grab a craft beer from our breweries, sample local fare at our farm-to-table cafes, explore the area’s music scene or simply soak up our small-town vibe. Whatever your druthers, the Tuck has you covered. Play on. The gentler rapids of the Tuck are ideal for first-time river runners and families with kids. 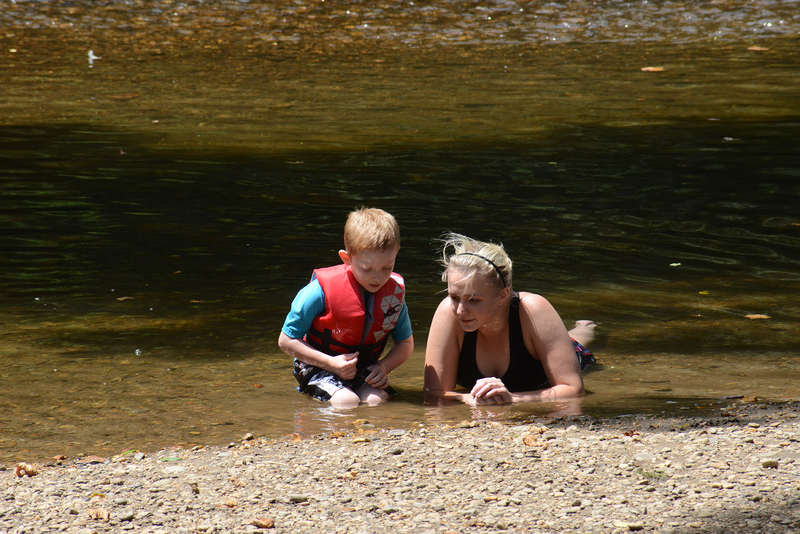 Unlike Western North Carolina’s wilder rivers, children four and up can join the ride. The primary rafting section of the Tuck — from Dillsboro to Whittier — is tame enough to pilot your own craft without loads of paddling experience, but has just the right touch of whitewater for a thrill, especially through the Tuckasegee Gorge. Three full-service river outfitters ply the Tuck’s waters with fleets of rafts and duckies (slang for an inflatable kayak). You can’t go wrong with any of them. 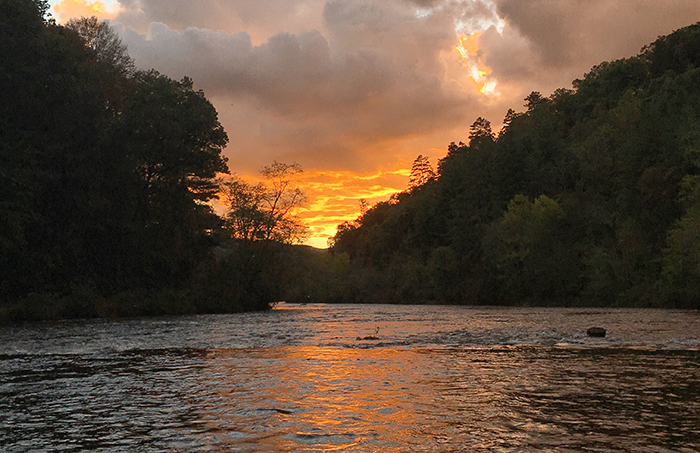 Tuckaseegee Outfitters, Dillsboro River Company and Smoky Mountain River Adventures offer guided trips or will shuttle you to the put-ins and take-outs for a self-guided adventure. If you have your own water craft and simply need a shuttle service, check with our three trusty river outfitters to hitch a ride. Some sections of the Tuck are suited for tubing. Tuckaseegee Outfitters rents tubes and will shuttle you to the tubing spots. If you’re tubing on your own, put in at East LaPorte Park and float a while before getting out to walk back up. If have two vehicles to make your own shuttle, you can float on down to Lena Davis Landing — just watch for warning signs above the river letting you know Cullowhee Dam is coming up as you the approach the take out. For canoes and drift boats, the section from East LaPorte to the CJ Harris access area is all fair game. Be prepared to portage around the Cullowhee Dam and make sure to take out at CJ Harris to avoid the class III rapids of the Dillsboro Drop just below it. The Tuck is made for playing, with limitless pastimes to fill a day at the water’s edge. Splash and wade, dunk and dive, and enjoy the cool, clear water flowing past you. 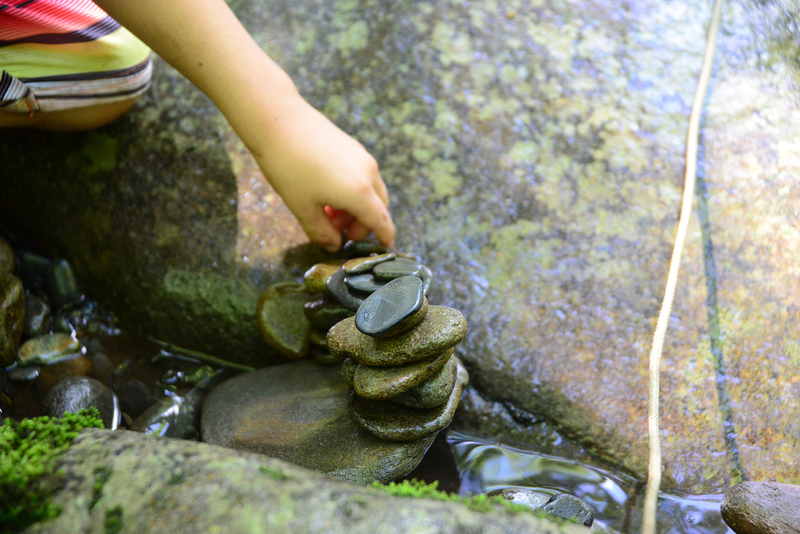 Stacking up rock cairns with smooth river stones is a favorite pastime for families. Don a snorkel mask and explore the underwater ecosystem — you’ll be surprised what you can see. Or just lounge in the dappled shade and cool breeze along the Tuck’s broad banks. Swimming holes and play areas are scattered along the Tuck’s public access areas. East LaPorte Park south of Cullowhee on N.C. 107 is one of our favorites. It has shallow pools for little ones, deep holes for full immersion, a grassy field for games and shady benches for sitting. Another good bet is Riverfront Park in Dillsboro, with a parking area just off U.S. 441. It’s a wide, gentle place to swim amid the excitement of launching paddlers. Even strong swimmers should always wear life jackets in moving water, especially children, as currents can be deceptive. 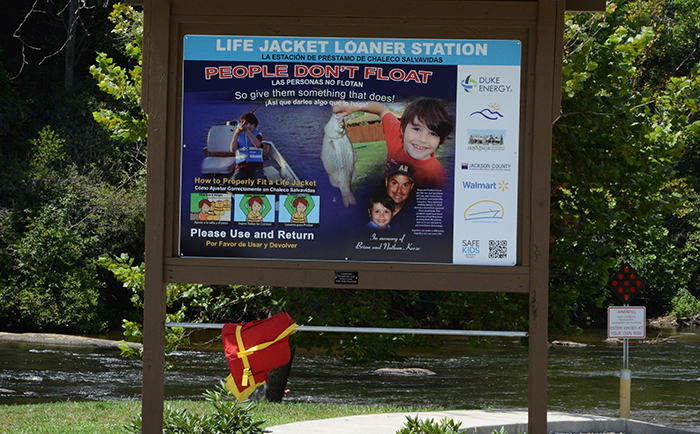 Several river access points have loaner life jacket stations to borrow and return. Whether you’re a whitewater enthusiast or enjoy the spectator sport of seeing paddlers at play, check out the river features known as The Slab and Eternity Hole. Paddlers queue up around The Slab and Eternity Hole for their turn to bob and surf on the recirculating waves created by river hydraulics. South of Cullowhee, turn off N.C. 107 onto Shook Cove Road and look for two parking areas about half a mile apart. The Slab and Eternity Hole are between the two parking areas, with the second access further upstream providing the shortest walk. For more whitewater action, check out the famous Dillsboro Drop located in the heart of Dillsboro between the CJ Harris and Riverfront Park access areas. Paddlers can test their skills navigating a rocky ledge that creates a class III falls to the delight of onlookers. Extreme paddlers can catch class IV rapids and plummeting waterfalls on the West Fork of the Tuck at special times of year. Whitewater releases fire up steep and gnarly creek-style kayaking for a 5.5-mile run on select dates. Paddlers from far and wide make the pilgrimage to run the Tuck’s west fork. A short-but-steep hike to High Falls just below the Lake Glenville dam puts you in touch with the Tuck’s headwaters any time of year, and is teeming with paddlers and action on release days. There are two releases right around the corner on August 12 and August 26, 2017.